After Bink’s appearance I’ve had quite a few requests for a Sock Monkey tutorial. 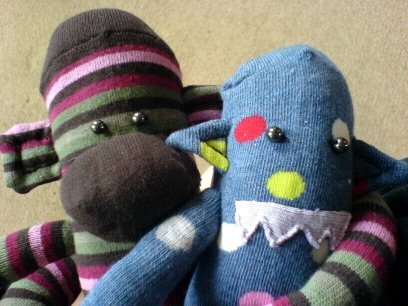 The sock monkeys started few years ago when a cash-strapped me found out via the awe inspiring Craftster.org how to make sock monkeys. That Christmas my nearest and dearest received customised sock monkeys as pressies. Bimp the little spotty sock monster is one of my favourites and was around the same time as Bink. For me it was a bit of an experiment with different stitches and techniques that worked really well. I made him with a pair of kid’s tights from Primark. What you can’t see on the photo is that he has a spiky dinosauresque tail made of the same material. Hubby’s monkey was originally inspired by the superbB.A. 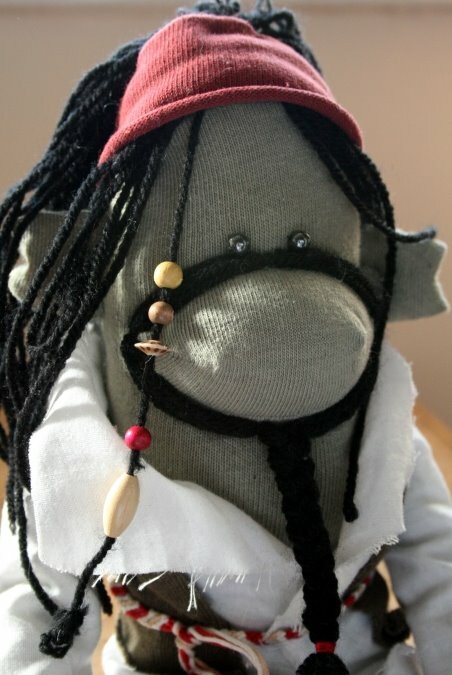 Baracas sock monkey, however I realised I was never going to be able to replicate it in all of it’s glory so had a go at Captain Jack Sock Monkey. His shirt was made from an old pillow case the rest of his outfit was mainly made from other socks (this is when all those odd socks come in handy). I made his belt by knotting together threads using half-hitch knots in the friendship bracelet way. Cheeky Monkey – pressie for brother. The Burberry-style check socks took some hunting down, even the trusty sock stall on the market didn’t sell them, eventually found them on ebay. These were by far the hardest to sew as the material stretched really strangely. 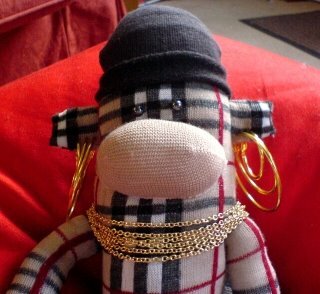 Cheeky Monkey is wearing this seasons finest “gold” jewellery by the top fashion house Primark. I also made a few other sock monkeys for cousins. While making them I learnt a few things. Cotton blend socks/tights work the best. The more synthetic the material the harder it is to sew. Primark, Asda & Tesco are a haven for sock monkey material. If I didn’t have to drag out my sewing machine from the depths of the wardrobe and take up the dining table every time I wanted to sew I would sew far more often. As for the method I can’t explain it any better than this tutorial by Kristine that includes picture. I really don’t want to reproduce it on here as that wouldn’t be fair so here is a link.